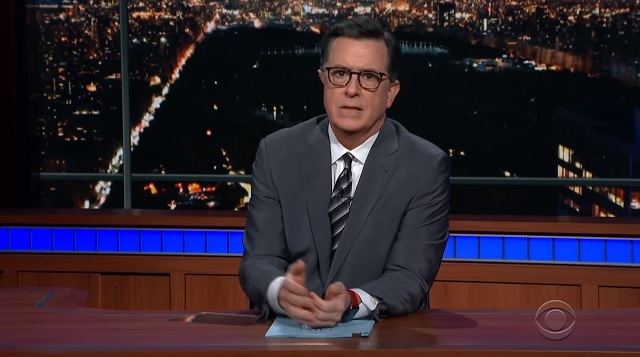 Late night comedian Stephen Colbert said Wednesday that he was "sincerely moved" by Gillette's widely-panned ad on "toxic masculinity." After making a corny joke about how their ad was "cutting edge," Colbert took a serious tone. "I was sincerely moved by this ad," Colbert said. "Especially the kids at the end." Though Colbert had nothing negative to say about the ad itself, he did criticize our "public institutions" for failing to teach us "moral lessons" like those in the Gillette ad. "Are our public institutions so weak that we need to be taught moral lessons by razor companies?" Colbert asked. Colbert dodged most of the controversy and instead attacked Fox News host Brian Kilmeade for getting "worked up" about mere "ads."